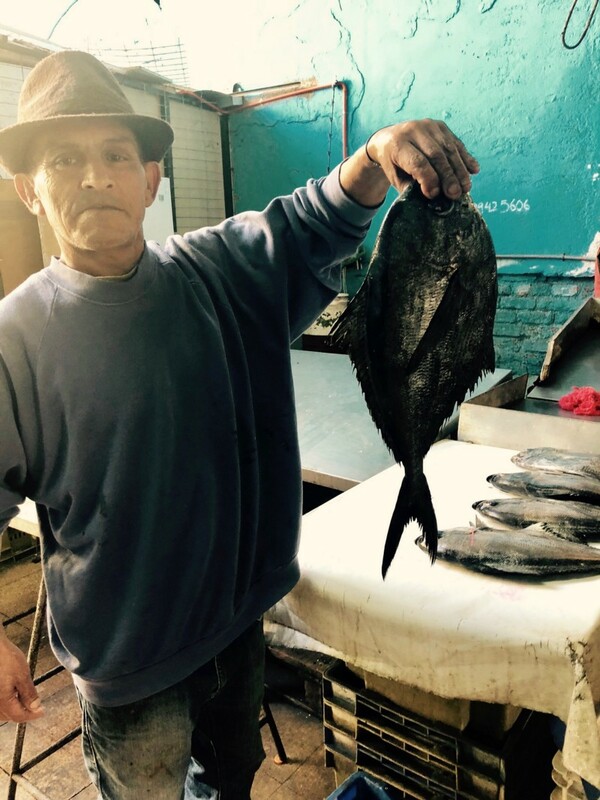 I first met José by email while I was planning my trip to Mexico a few weeks ago. When I plan a trip, the first thing I do research on is potential hosts for Take Me Cooking! 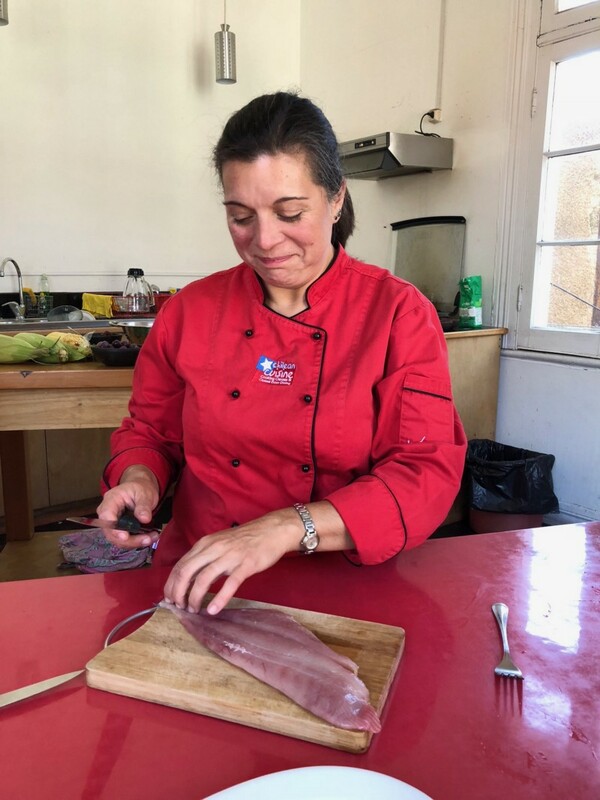 The truth is, I am very grateful for the cooking community I met thanks to this venture, they are amazing and I’m so happy to share about them on this blog. José created a chocolate studio called Totokin in Condesa, Mexico City. After a few exchanges by email and WhatsApp, we arranged to meet. That day, José explained to me the imaginary tale behind the name Totokin. Totokin is a penguin who lived with his family and friends on the Glacier, but he felt that there was something different about him, something magical. Suddenly, he magically turned into a Golden Penguin, with a wonderful power: everything he touched could turn into Chocolate. This is how Totokin touched the Glacier and turned it into a Chocolate Glacier. With his powers he was able to melt it and transformed it into a river of refreshing chocolate in which he dived and heated it into a lake of hot chocolate. In the same way, he built a magical world made of chocolate in all its forms, including cookies, ice cream and cakes. Totokin also discovered that the source of his magic came from nothing more and nothing less than his heart because he was born with a chocolate heart. TOTOKIN actually comes from the word Nahuatl TOTOXOLOTL which means PENGUIN and the word Maya TAAK’IN which means GOLD. KIN also means GOLD in Japanese. With what TOTOKIN means GOLDEN PENGUIN. The day of my visit to Totokin studio, José had received a personalized order for a local business: Skull chocolate Candy! I was in Mexico City just before the Day of the Dead, so this order made total sense. Totokin is a company dedicated to the manufacture of Chocolate and Chocolate Products with a focus on the healthy market: sugar free, vegan, organic. All their ingredients are local! José also organizes in their cooking studio a few workshops around the different uses of their delicious chocolate. That day in Mexico, I was lucky enough to have a personalized workshop with José and the Chef, making those bite size skull chocolate! We used white and dark chocolate and a passion fruit syrup that brought a beautiful color to it. I had a lot of fun, it was super original, not the typical cooking workshop, but definitely worth it if you like chocolate! A few months ago, I went to the UK and visited Gemma and Matt to have a Take Me Cooking’s team reunion. I stayed for a week and I had the best time talking business but also getting to know them better! 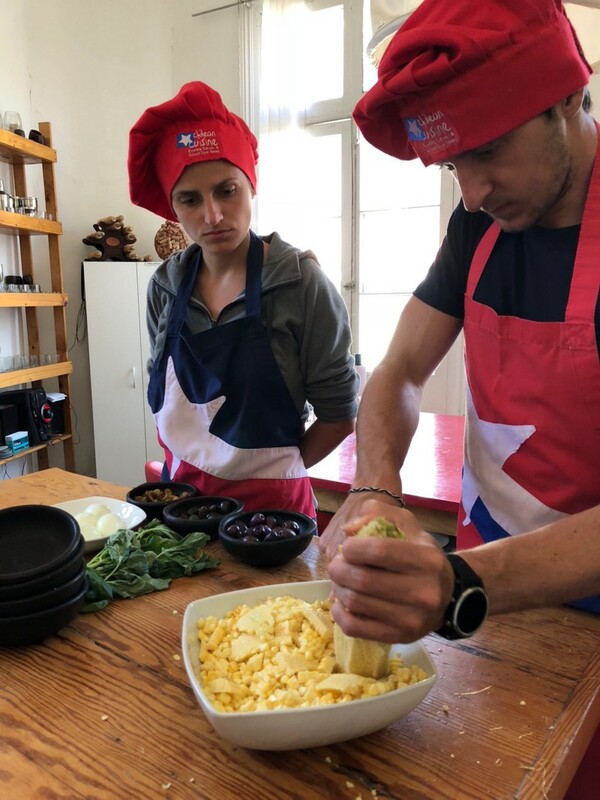 We work together as a team on Take Me Cooking remotely: I’m based in Argentina and Gemma and Matt live in the East Midlands, a beautiful region as I got to see for myself that week. One of my favourite moments during my stay was sharing recipes and cooking together with Gemma who’s also passionate about cooking. She’s previously wrote about how she discovered the Tarte Tatin, one of my favourite French desserts. Today, I want to tell you about the day she shared with me her passion of Indian food. We cooked a whole Indian meal and I was impressed by the flavours and originality of the dishes! We made Onion Bhaji’s, Chicken Korma and a salad called ‘Chaat’. I loved it all, but the best and most original to me was the salad: it is a cold salad inspired from Indian Street Food. The recipe was so delicious that I’m going to give it to you here, as Gemma sent it to me (Thanks!). Empanadas are one of the most typical food in Argentina, you can find it in every corner in Buenos Aires! 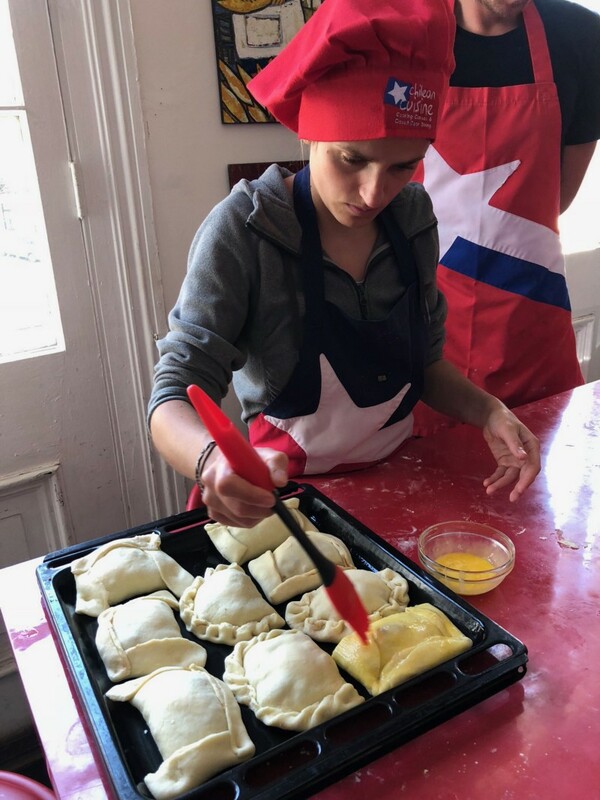 Nella is a host at takemecooking.com and offers a delicious cooking workshop where you’ll be cooking empanadas from scratch while drinking Argentine wine, a must when visiting Buenos Aires. Nella hosts this experience with the collaboration of Tour F, a travel company specialized in authentic experiences with locals in Argentina. I’ll let you discover Nella’s recipe below. It is divided in 3 parts, the dough, the fillings (3 options of fillings here!) and the assembling. As you can see, beef fat is a main ingredient for the dough. It is the traditional way of cooking in Argentina, a country that produces and consumes many different beef products. It is still very much used today. It can be replaced by butter or oil if you don’t find beef fat in your local store! Build a crown with the flour. Put in the middle salt, beef fat and water. Knead everything together. Spread dough with the help of a rolling pin. Cut it in circle. Left the dough to stand in the fridge for at least 30min. Warm up the oil in a pan. Add the onions finely chopped and cook until a nice light brown, then add the red capsicum. Cook until golden brown. Season. Add the finely chopped pieces of meat, stir, add the pureed tomatoes and cook at medium fire until the meat get completely cooked. Boil the chicken. Warm up the oil in a pan. Add the onions finely chopped and cook until a nice light brown, then add the red capsicum. Season. Add the finely chopped pieces of chicken, stir and cook at medium fire until golden brown. Warm up the oil in a pan. Add the onions finely chopped and cook until a nice light brown, then add the red capsicum. Add the butter and stir until it melts, add the flour and cook a bit at medium fire without letting the roux getting too brown. Add the milk at once and stir constantly so it doesn’t ́t go lumpy. Then add salt, pepper, ground nutmeg and corn. Let it cool down and add the grated cheese. Fill up the empanada, close and twist it (repulgar). Paint it with an egg. Cook it in the oven for approximately 20 min. Ushuaia, the “End of the World”, at the southernmost tip of South America. We went there at the end of April, which is still Autumn time in the Southern Hemisphere. But the temperatures we experienced there were actually closer to Winter time! So I’d recommend not to go much after those dates except if you like cold temperatures. In practice, we took a plane from Buenos Aires to El Calafate and then another plane to Ushuaia and then one last domestic flight to go back to Buenos Aires, from where my dad and brother had their flight back to France. Let’s dive into my favorite parts of the trip! All the pictures are mine. As one can read in Wikipedia, this glacier is unusual in that it is advancing, while most glaciers worldwide are retreating. The reason remains debated by glaciologists.The terminus of the Perito Moreno Glacier is 5 km (3.1 mi) wide, with an average height of 74 m (240 ft) above the surface of the water of Argentino Lake. It has a total ice depth of 170 metres (558 ft). We spent the day around the glacier, first we did a boat trip to get close to the ice and then we went on a hike which gives you a great view of the whole thing. The clouds were hiding the top of the glacier as you can see in the following picture, but I was amazed by the beautiful ice. We could hear the birth of icebergs from times to times when big chunks of ice were falling in the water, absolutely magical. From El Calafate, we also spent one day in El Chalten, a small village where a lot of hikes depart from, the ultimate trekking destination in Patagonia due to the wide variety of trekking routes accessible to all fitness and experience levels. We chose an easy hike (8 km) to get a chance to see the Fitz Roy peak, located at the border of Argentina and Chile. It was an easy and beautiful hike but we were unlucky because the clouds were surrounding the peak. It’s quite usual to have clouds around the Fitz Roy peak. Do not hesitate to go anyways since the whole hike is worth it and you might even be lucky and see the Fitz Roy when you go! While we were in El Calafate, my dad wanted to go fishing and we passed by a shop called El Calafate Fishing, so we asked if we could go fishing for a day and they recommended us to try the Fly Fishing technique which is a famous sport here! We were curious to try, so we went fly fishing in Roca Lake, nearby. So yes, we had to wear those crazy outfits to go in the (cold) water! I have to confess we weren’t lucky and did not catch any fish but I loved the process. Fly Fishing is an art and I really appreciated the sport and the challenge. The name Tierra del Fuego was given by the Portuguese explorer Ferdinand Magellan while sailing for the Spanish Crown in 1520; he was the first European to visit these lands. The archipelago consists of the main island, Isla Grande de Tierra del Fuego, with an area of 48,100 km2 (18,572 sq mi), and a group of many islands, including Cape Horn and Diego Ramírez Islands. Tierra del Fuego is divided between Chile and Argentina. Following the establishment of a prison in Ushuaia, in late 1909 and early 1910 the railway line called the End of the World train was established. The steam engine driven railway was built over a length of 25 km (16 mi) into the Tierra del Fuego National Park. The line connected the prison camp with the forestry camp. The primary purpose of the railway was as a freight line to serve the prison of Ushuaia, and hence was known as the “Prison train,” and was used specifically to transport prisoners to the camps and transport the logged timber from forests. Now the steam engine is still working but transports tourists only! It’s a fun way to visit the National Park and get to know more about its history. This one is one of my favorites. We were lucky enough to be there for the first snow! The lake was even starting to freeze at its edge. I loved the colors: the emerald from the water and the white snow were unforgettable. You can go on your own but I recommend to go with a guide because the path is not always clear and it can get tricky. Les Eclaireurs Lighthouse (the French name “Les Éclaireurs” means “the Scouts”) is a lighthouse standing in the Beagle Channel, a strait separating the main island of Tierra del Fuego from various other small islands. We went on a boat trip in the Beagle Channel from Ushuaia port. It was a nice boat ride and we got to witness sea lions near the lighthouse, they are quite cute animals. In the City Center of Ushuaia, we went to visit a Museum called Museo Maritimo y del Presidio. This museum stands inside an old prison. Here’s an extract from this interesting news article which explains why a prison was built at the End of the World. At the turn of the 20th century, Argentina and Chile were both pursuing southern expansion and several battles had already been fought over territorial claims. Control over Tierra del Fuego was considered especially important because the Magellan strait was an important strategic passage between the Atlantic and Pacific oceans. For these reasons the government in Buenos Aires decided it was necessary to establish a population in this far-flung territory. When the construction of the national penitentiary began in 1902, there were already a dozen prisoners living in wood and tin huts. The convicts sentenced to the penitentiary in Ushuaia were dangerous repeat offenders and political prisoners sent down from jails in Buenos Aires province. The prisoners themselves were forced to construct the penitentiary. When the building was finally completed in 1920 it included a central hall and five pavilions, each with 76 individual cells. The prison, however, was habitually overcrowded and often crammed over 600 prisoners into its 380 single cells. Many were serving life sentences, and they were forced into tough manual labour. Projects included the construction of Ushuaia’s first electricity generator and grid, roads, bridges, printing press, telephone wires, sewage system and fire department. As compensation for their labour prisoners received a tiny salary and a primary school education. The prisoners were also compelled to venture out on the infamous “prisoner’s train” to retrieve lumber from the forest which today makes up Tierra del Fuego National Park. Though a couple of escapes were attempted, each time the runaways returned to the prison begging for shelter and forgiveness. In 1947, with Argentine territory in Tierra del Fuego firmly established and Ushuaia a functioning city, president Juan Domingo Perón closed the national penitentiary for humanitarian reasons. Some areas of the building were not renovated and you can feel how sinister this prison must have been. Visiting this museum is a must to understand the history of the City and the region. The Patagonian toothfish is a species of cod icefish found in cold waters between depths of 45 and 3,850 m. My dad is big on fish but he had never heard of this one and he was amazed by it. This species is far from the fish we are used to eat in France. Its average weight is 7–10 kg (15–22 lb), with large adults occasionally exceeding 100 kilograms (220 lb). If you like fish, this is a must since you are in the right region to try it, surrounded by the cold waters of Ushuaia. The best one we had was at the Cauquenes Hotel Restaurant, from where the picture below was taken! King Crab is another of the region’s seafood specialty and you can try it in different dishes, from an entree like the picture below or as a main course, such a treat! 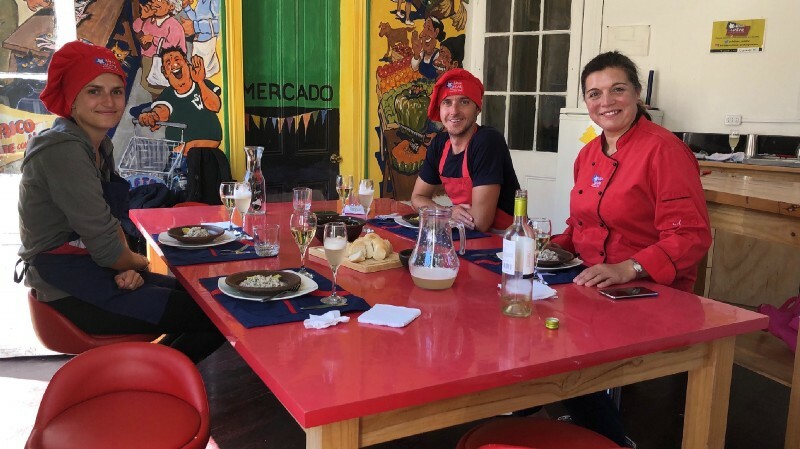 This picture was taken at the Cauquenes Hotel Restaurante, during a cooking experience. That day, the Chef showed us how he made some of the dishes served at the restaurant. Last but not least, I think you deserve a treat after all of these activities! This spa is amazing, with beautiful views to a lake overlooking the Andes Mountains! Perfect after a day of hiking in the snow. Cordoba Region is not the typical destination when visiting Argentina. But it actually is a well known destination for Porteños, inhabitants of the port and capital, Buenos Aires. It is not far, a couple hours by plane or an overnight bus trip from Buenos Aires. It is the second largest city of Argentina, but Porteños actually like to spend their holiday out of the city of Cordoba, in the beautiful mountains surrounding the city. I went to Cordoba a couple months ago on my way back to Argentina from Chile. Cordoba is located close to the border between the 2 countries. I decided to stop there because I was curious of this region and also because a friend was celebrating her birthday there that weekend, 2 very good reasons to go! The first few days, I stayed in the city to explore it and I worked in a few very nice cafés with good wifi. I particularly recommend the Club de Café (in the street Duarte Quiros). I always look for good places to spend a few hours with my computer and a nice coffee, wherever I go. I felt comfortable and safe wandering around in Cordoba, it actually looks a little bit like Buenos Aires, but more relaxed! As a coincidence, I had received a message from Mati a few days before the trip. Mati got in touch with me because he heard about Take Me Cooking and he loved the idea! He had traveled a lot himself and was now based in the Cordoba region with his family. Since I was planning to go to Cordoba, we planned to meet. Mati has studied cooking and he’s recently opened a restaurant, so he told me he would love to host a cooking experience himself and it sounded amazing. The following day, he offered to take us to visit an interesting spot near his restaurant and show us around, it was so kind of him! Mati was born in the region and he knows it well, so it was an absolute treat to have him as a guide for a day. We began that day by a 2-hours drive to La Cumbrecita. This village is beautiful but surreal, it’s actually a Swiss-German village that was meticulously recreated by a German family from Berlin who bought the land in the 1930s. It’s true that the vegetation reminded me of the Swiss mountains, but we were also bluffed by the wooden cabins, the street signs in German and the restaurants that served schnitzel and goulash and Bavarian-style beer! You can read more about the origin of La Cumbrecita in this interesting article by The Telegraph. So we wandered around the tracks and stopped to have a German lunch in one of the many wooden cabins (there are many hotels and restaurants since the spot is unique and a great nature getaway). After lunch, time to hit the road again, next stop: Tertulia Bar. Mati and his mother run this bar/restaurant in a small village between Cordoba and La Cumbrecita. It’s located in a beautiful green neighborhood and they make you feel at home! Literally, the bar used to be a house and the kitchen is at the center of it, completely open so you can see Mati at work. In the back garden, the traditional barbecue is ready for some yummy cooking as well! We had some delicious craft been and a beautiful platter of picadas, a typical food similar to finger food. Cordoba region is famous in Argentina to have some of the best fresh dry sausages, cured meat and cheese. 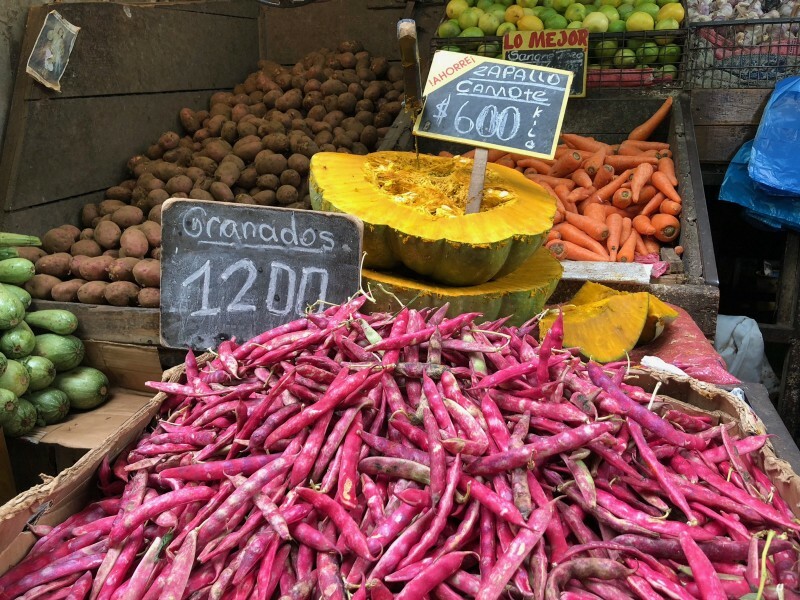 Although Cordoba region is not in most touristy itineraries, I absolutely recommend to stop there, at least for a couple days, to explore this amazing region off the beaten path and taste delicious local food! 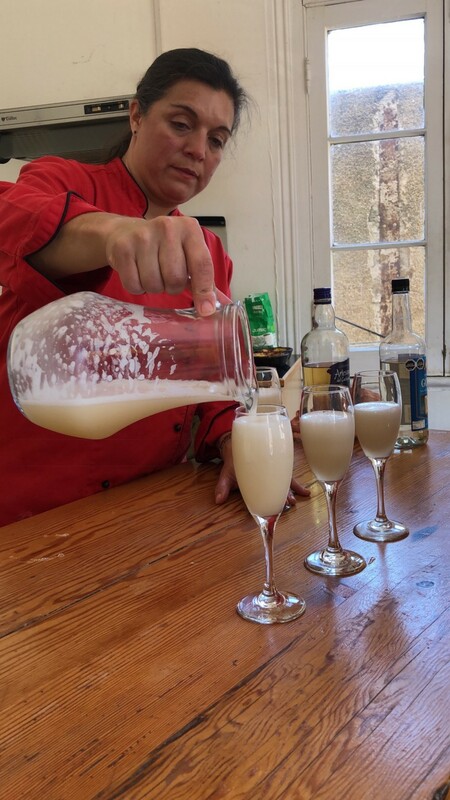 If you stop in Cordoba, don’t miss the occasion to meet Mati and learn more about the Argentine plow disc cooking style! It looks like a wok, but it’s actually much more, learn more about this barbecue cooking technique in this Los Angeles Times article. In 2017, I was lucky enough to be invited to, not one, but two weddings and one of them was taking place in Palm Springs, California. A few years ago, I visited San Francisco and I enjoyed it, but, to my surprise I enjoyed Southern California even more! Let me tell you why. Los Angeles has the reputation of being a city where you can’t go anywhere without a car and this is definitely the case, but with apps like Uber, owning a car is not the only option anymore. Another transportation option I wasn’t expecting to be convenient in LA was the bike. I had booked my first Airbnb experience (ever) and it was a Beverly Hills Bike Tour. When I arrived at the bike shop, they told me I was the only one who had booked that tour and they offered for me to join another group instead for a much bigger tour that would take me all around LA county. It sounded like a lot of cycling (around 30 miles!) but it also was an upgrade that would allow me to visit all the different neighbourhoods and not just Beverly Hills. So, I saw an opportunity there and I said yes! 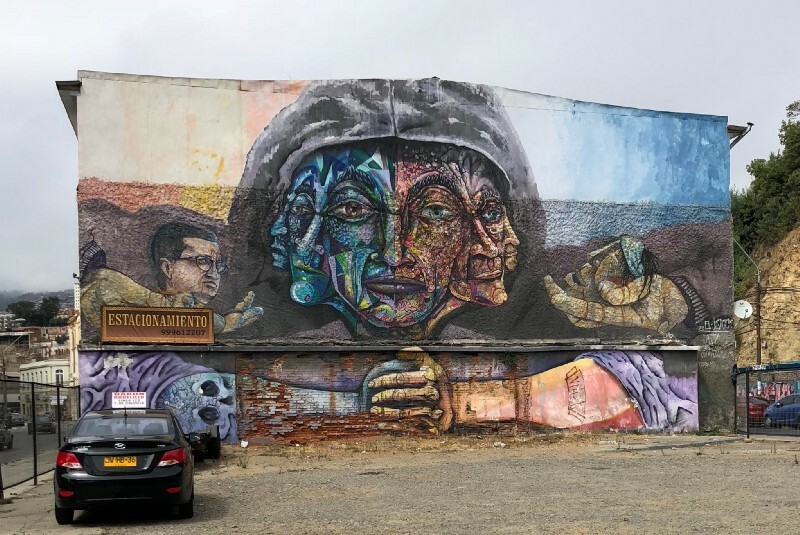 I think I did well because this tour completely shifted my perspective and I discovered that LA was not all about the cars, but could also be very enjoyable by bike. The variety of urban and natural landscapes is astonishing. We started with a glamourous tour of the famous mansions in Beverly Hills and Bel Air and then we went all the way until the ocean, from Santa Monica to Venice and back to West Hollywood. I absolutely loved it. The weather was incredible, the guide was really nice and I met great people who were doing the tour with me and with whom I’m still in touch today. It made me realise that the fact that Los Angeles is so spread out can be a good thing and allowed us to have a long and enjoyable bike ride from the mountains to the beachside. I also recognise that the guide, Dan, helped us really enjoy this ride as he knew exactly where to go and made everything so smooth. When we were in Venice beach, someone mentioned a Netflix show that was all about this neighbourhood, Flaked, and I had a lot of fun watching it afterwards! Booking a bike tour is now on my list anywhere I go. A few days after, I was on my way to my second Airbnb experience which was located in the South of LA. I booked it because its originality appealed to me and it seemed in touch with the local community which is everything I’m looking for when I travel. The experience was called Harvest Trade & Lemonade. When I arrived, I was the only one who signed up that day, a private experience, great news! Just in time to meet my host, Army, and we were already on our way to explore the neighbour’s trees in her Jeep. We started with a beautiful pomegranate tree and we started picking them up with a special tool I had never seen before (I guess I’m an urban person): a fruit picker basket! It was quite a challenge but I managed to pick up some fruits and it felt amazing. We then went to pick up lemons and oranges in the back yard of a friend of a friend of Army’s a few more blocks away. I thought this experience was such a great idea since so many people don’t have time to pick fruit in their own garden, it would be a shame if no one picked them. What’s more, each time, Army offered to give some fruit to the tree owners, so it’s a win-win situation. While we were hopping from garden to garden, Army was also giving me a tour of the area. It was gorgeous, with a beautiful sunset over the ocean. Upon our return to her house, we used the fruits we had just picked to make lemonade and a gigantic fruit salad to go. I had such a great time and I enjoyed getting to know Army, she’s a beautiful person! When Army heard about Take Me Cooking, she got curious and thought it would be nice to cook the fruits in whole recipes and host a cooking experience. So, I am happy to announce today that you can now book a fruity cooking experience with Army on www.takemecooking.com (and it includes fruit picking! ).